No one wants to talk about resolutions this year. I think it’s because many people have made them and promptly broken them. People who work out at clubs can tell you that for 3-4 weeks beginning in January the places are jammed, but then, thankfully, all the newbies go back to their normal inactive lives. The brink of a new year makes us think about ways to improve our lives. We imagine a leaner, healthier, more creative, happier new year. We make goals and begin to follow through on them. And then we just forget about it until next year. Why? Don’t we really want to have that life that we envision for ourselves? Then why don’t we do it? In 2014, I resolve to exercise for at least 30 minutes 3x per week AND shop for great deals at TJMaxx not more than 1x per month. I do think it is unrealistic that you’ll give up entirely something useless that you do enjoy, but you get the idea. I think the resolution has to have 2 parts and then you probably have to hold yourself accountable with a chart that lives in the car. Record the date you went to the store for that month so you don’t forget. Also make a written record of your workouts. It does reinforce that you are being successful. 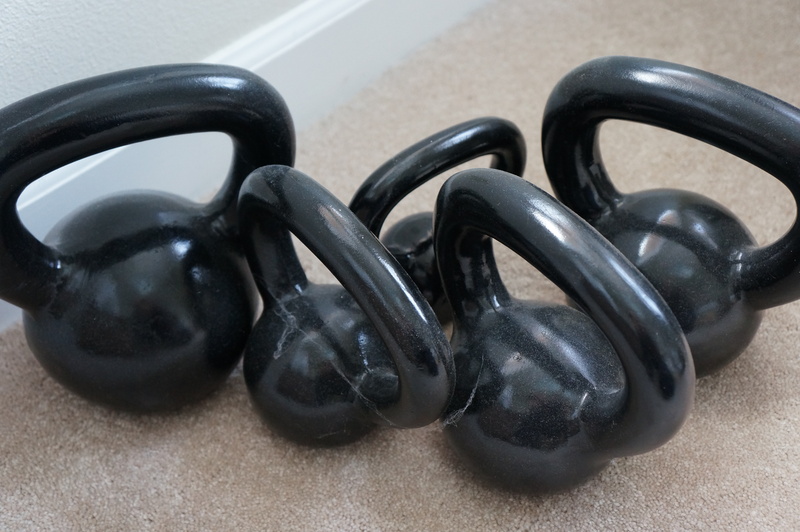 Can you see the cobwebs on my kettlebells? Maybe you can guess what my resolution is about this year? I also think that when people make too many resolutions they are dooming themselves to failure. You are not going to quit smoking, lose weight, start exercising, learn to cook healthy, stop yelling at your kids, and clean the house more all at once! I suggest picking 1 that you’d really like to conquer. That will be a huge accomplishment when you really incorporate it into your life for good. Pick the one that you’ve been wanting for the most time. Once you get that one under control you will have started a snowball to attempt the others one at a time. I’d be interested to know how your resolutions work out this year, especially if you use any of my suggestions! Peace and prosperity, health and longevity, love and learning for all in 2014!